Former Springbok centre Wynand Olivier has announced his intention to retire. Junior Springbok coach Chean Roux has named his side for Wednesday's clash against Argentina U20s in Stellenbosch. Rob Houwing reckons the Stormers and Bulls, especially, are impeded by a series of Bok player sit-outs all happening at once (and clumsily so?) this weekend. The Springbok Women will host Scotland in two encounters in Cape Town in September and October. Three Springboks are reportedly set to sign lucrative deals with clubs in Japan. Former Springbok and Western Province flank Jan Boland Coetzee has received an honorary doctorate from the Stellenbosch University. Junior Springbok coach Chean Roux praised his team’s character to rack up a 50-8 victory against the Namibia XV on Saturday. The Springboks have strengthened their management resources for the Rugby World Cup year by creating a new role to look after player affairs and welfare. 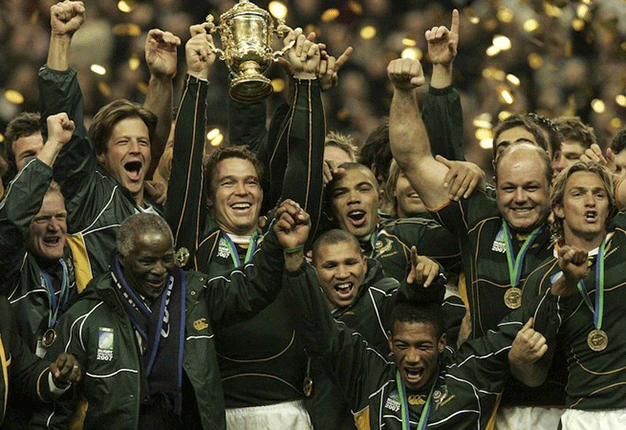 11 years after the Springboks secured the 2017 Rugby World Cup title with a win against England, former skipper John Smit re-watches the final. The Springboks talk to SuperSport what it is like and what it means to sing the South African anthem ahead of their clash against the All Blacks. The new ASICS Springbok jersey, developed out of years of technical expertise will carry our heroes into the future. The Springboks' new management team was confirmed on Thursday, with Director of Rugby at SA Rugby, Rassie Erasmus, given with the position of head coach of the senior national team. Following the announcement, Erasmus insisted that he was not 'self-appointed'. Watch. Newly appointed Springbok head coach Rassie Erasmus will spearhead the Bok management team until the end of the 2023 Rugby World Cup. A Springbok 'season ticket' has been launched by SA Rugby in the hope to of getting the national side the biggest possible send-off ahead of this year's World Cup in Japan. Bok coach Rassie Erasmus shares several strongpoints with decorated NZ rival Steve Hansen, the author of a major book on the All Blacks tells Rob Houwing. Springbok Women's coach Stanley Raubenheimer has assembled a squad of 40 players for a national assessment camp in Worcester next week. Springbok assistant coach Jacques Nienaber had shared some valuable insights with the SA Rugby Academy players in Stellenbosch. Scrumhalf Cobus Reinach could still be a part of the Springbok squad for this year's Rugby World Cup in Japan. Springbok coach Rassie Erasmus believes the national side is on course to reach its 50% transformation target in 2019. SA Rugby can no longer afford to compete with European markets when it comes to securing the services of the country's top rugby players. Utility back Cheslin Kolbe has his sights set on playing for the Springboks at the Rugby World Cup in Japan later this year. Veteran Springbok international Francois Louw has signed a new contract with Bath that will extend his stay at the English Premiership side into a ninth season. Springbok coach Rassie Erasmus says he is in constant communication with the country's Super Rugby coaches over how best to manage his players. South Africa's Super Rugby sides have gone back to a more traditional approach in 2019 - and Springbok coach Rassie Erasmus likes what he sees. The Springboks’ 2007 Rugby World Cup winning captain, John Smit, has thrown his weight behind the revival of club rugby. Japanese club Toyota Verblitz, coached by former Springbok boss Jake White, have announced the signing of Willie Le Roux from London Wasps. The Junior Springboks will face the Under-20 teams of Georgia and Argentina, as well as a Namibian XV in the International Series. SA Rugby's representatives will report back to internal stakeholders, following the latest discussions on the World Rugby Nations Championship concept. Springbok coach Rassie Erasmus likes the idea of World Rugby implementing an international league format. Head coach Rassie Erasmus says he has settled on around 80% of his Springbok squad for this year's World Cup in Japan. Rassie Erasmus says he has started thinking about who should succeed him as Springbok head coach in 2020. SA Rugby has announced free entry to The Springbok Experience after reluctantly taking the decision to close the rugby museum.